According to Popular Electronics, the Sentry might not have been the first detector available, however, it was definitely the most functional and practical, and probably the first one worth noting. In the article it says that in the 5 years since the 1956 "Truth About Radar" article: "many microwave detectors have come and gone. Popular electronics has investigated each new speed-trap detector and has rejected some because they violated government regulations; others because of size, weight, or impractical construction; and one or two because they were simply 'wishful thinking'." 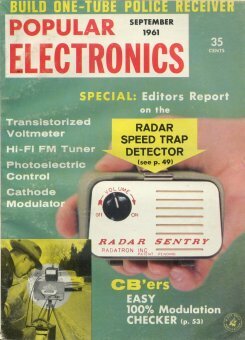 The Radar Sentry was priced at $39.95 in 1961, which roughly equates to around $250 in today's dollars. The early units detected S-Band radar operating at 2.455 GHz. Later units were adopted to detect both S-Band and X-band radar. The Sentry was actually cordless, running off of 2 AA batteries. According to Radatron, they should last 800-100 Hours, equating to 35,000 miles of driving (assuming an average speed of 35 MPH!). For mounting, it was recommended that Sentry be clipped to the sun visor. 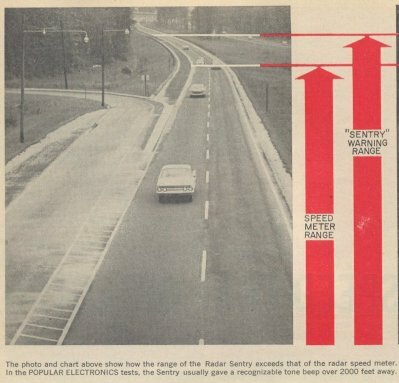 According to tests done by Popular Electronics, the Sentry would warn the motorist 1000 to 2000 feet away from an operating "speed meter". "At high speeds Radar Sentry is almost useless; there just isn't time to slow down before police radar has tracked the car's telltale blip. But at speeds in the lower 60s, the gadget is a fairly faithful watch-bird within 300 ft. of the radar installation. Radar Sentries are being turned out at a clip of 200 to 500 a day by Radatron, Inc. in North Tonawanda, N.Y.. and the company claims to have sold 25,000 Sentries in the last six months." In the article, they go on further to say that Sentry did not make police happy at all, and that within a year of being introduced, the Sentry was banned in Chicago, Washington DC, and Conneticut. The units were later banned in Virginia too. 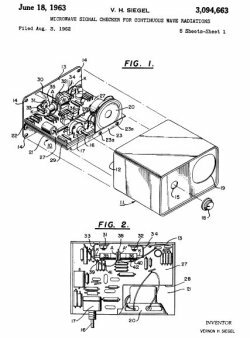 The patent actually references the detector design in the January 1958 CQ article, so it is a good possibility that the Sentry is loosely based on it, with some improvements. The two schematics have some similarities. Interestingly, on page 12 of the patent, it also outlines a system that "makes it possible for the policeman to know when an approaching car is detecting his signal". An early concept of an RDD? 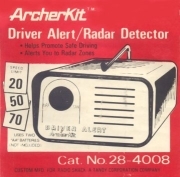 Later versions of the detector that came in kit form, and were called the Driver Alert. These were sold out of Lafayette Electronics catalogs, or through Archer/Radio Shack. The Radar Sentry seems to have been produced for a number of years, at least into the early 70's. "We made almost a dozen runs at the gun, first with one detector on, then the other, then both, and came to the following conclusions: The Snooper (the expensive model) gave a loud and clear warning a full quarter-mile before the gun could get a reading, while the Radar Sentry gives a very weak and almost imperceptible signal about a tenth of a mile before the police get a reading. The Radar Sentry gives off its loudest warning at about a quarter of a mile before the actual radar unit’s location but a quarter of a mile after the unit has recorded your speed. 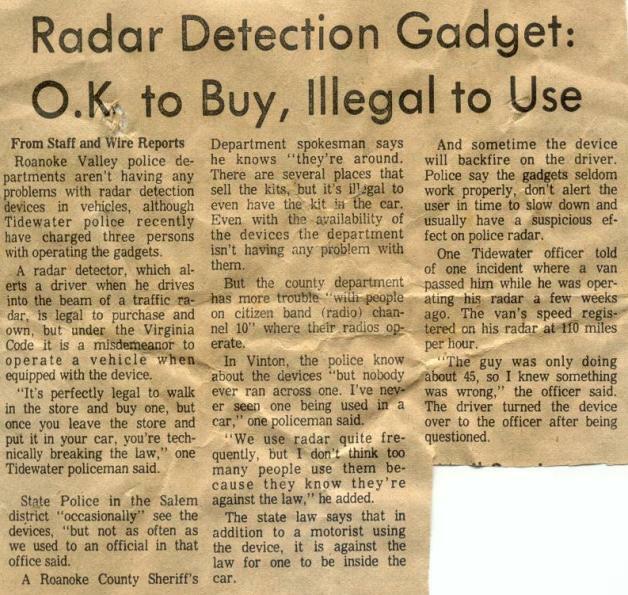 In other words, when The Snooper goes off, you’ve got about 1000-1300 feet to hit the binders if you’re speeding; when the Radar Sentry goes off loud enough for you to hear it in a normal driving situation, you’d better reach for your wallet if you’ve been speeding, ’cause you’ve been had by The Man."